Funding from the Canada Foundation for Innovation and the Quebec government purchased several key instruments. 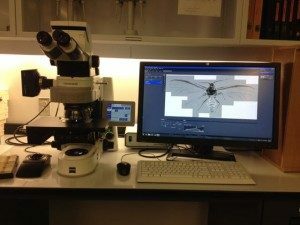 A Zeiss M2 Imager microscope with integrated Zen software. 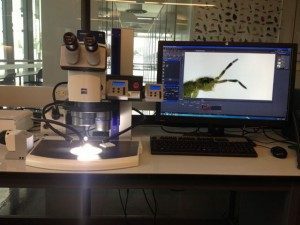 The microscope features a robotic stage that allows us to scan insect slides in three virtual dimensions. The microscope images the specimen in a series of tiles (X and Y axes), as many as needed to image the entire specimen, depending on the magnification. It also images the specimen in the Z axis, taking pictures in as many focal planes as desired. The digitized “cyberspecimens” will be on the Internet soon, via our private server. They will be viewable directly from any web browser. A Zeiss V.20 stereoscope features mechanical zoom and focus. We can therefore program the instrument to automatically photograph specimens in multiple focal planes.